The China Glaze Texture Collection was just released in March. 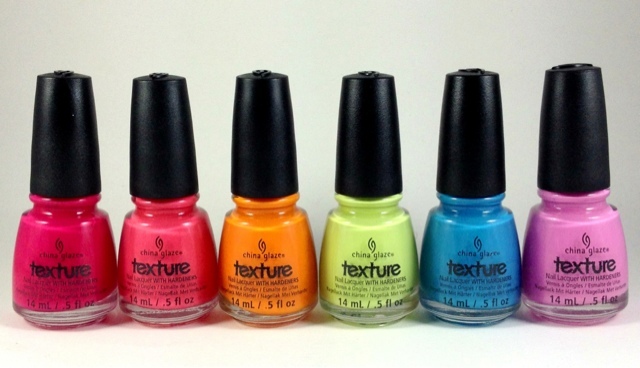 Unlike other texture polishes that have been released these are neon and glossy! Perfect for summer and different. There are six shades in this collection. Bump & Grind, Itty Bitty & Gritty, Toe-Tally Textured, In The Rough, Of Course! and Unrefined. Itty, Bitty & Gritty is a classic pink (pointer and ring finger) while Unrefined is a pastel pink with lavender tones (middle and pinky). I used two coats to get a full, gritty coverage! The polish went on liquidy and almost crystallized on the nail as it dried. Dry time was quick and painless. I was most excited to see the brights from this collection! Bump & Grind is a neon pink and really stands out. Toe-Tally Textured is a bright orange that I had no complaints about. In The Rough is a light lime green and Of Course! is my favorite because of the gorgeous creamy blue formula! Overall these polishes all had the same formula. One coat was a bit streaky and not as grainy as I wanted it but two coats filled everything in beautifully and gave me a very nice texture. The dry time was quick and easy and the texture is noticeable but smooth so you won't have any snags to worry about. 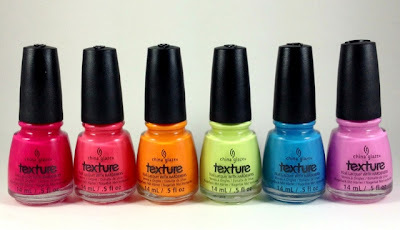 This is a really fun summer collection and I can see myself using these as accent nails all summer long! You can't go wrong with any of these. My only complaint is that there is so much pink! I would have loved to see one of the three pink shades swapped out for a red or yellow to make this a rainbow collection. For a chance to win this entire collection follow me on Instagram @DullLikeGlitter! I am having a nail art contest with the theme Nail Wars! First prize will with this collection as well as a glow in the dark mini set. There will also be a second prize! You can find me on instagram here. I'd state. That is the very first time I frequented your website page and to this point? I amazed with the analysis you made to create this particular publish incredible. Excellent process!